The young man on the picture isn’t red-haired, he doesn’t wear curlers either. 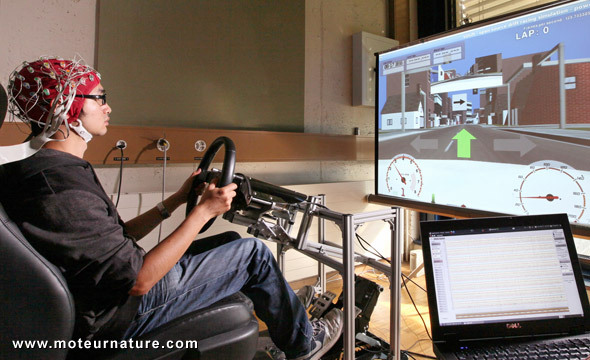 What he has on his head are electrodes measuring and recording all activity from his brain, while driving on a simulator. It’s a research project following several objectives, with safety first. Suppose this young man wants to turn left. After doing it several times in different circumstances, the computer will have recorded the brain signals associated to that change of direction. We can now imagine that inside a car, that same device could switch on the turn signal. Going further, the same technology could also help the disabled who are unable to drive normally. They would drive with their brainwaves. After long hours of practice, several tests already have been successful with people in wheelchairs. Nissan is working on the issue in partnership with the Ecole Polytechnique Fédérale de Lausanne. We shall not expect anything from that work to get into a production vehicle anytime soon, but we imagine that in an emergency situation, anything that can improve the brain-machine interface would be useful.